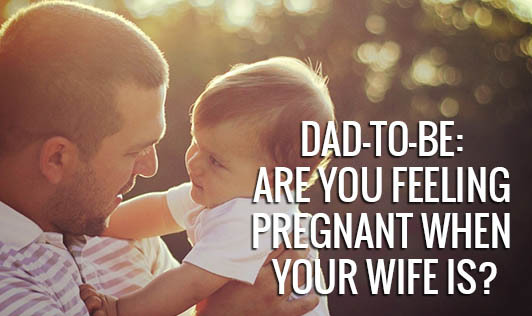 Dad-to-be: Are you Feeling Pregnant when your Wife is? A few men can actually feel their stomach bloating along with their wives' or they can wake up with morning sickness like their pregnant spouses. Recently the St. George's University in London has coined a new term for the same, "Couvade syndrome" -or "sympathetic pregnancy" (in French, "Couvade" means "to hatch"). Mood swings and morning sickness were the most common pregnancy-associated symptoms that these men showed. A few men developed 'pseudocyesis' -- a phantom swollen stomach during sympathetic pregnancy. Surprisingly not just new-dads to-be, but a non-pregnant woman can also show sympathetic symptoms similar to her pregnant twin sister. Couvade syndrome may be a psychosomatic condition and researchers suggest that it could be a man's anxiety over the impending child birth or even his "statement of paternity". More research is required to arrive at exact causes for these mysterious links between the mind and body.